I read this article and found it very interesting, thought it might be something for you. The article is called 10 money-saving hacks every savvy traveller knows and is located at https://www.ebookers.com/travel-blog/ebookers/research/10-money-saving-travel-hacks-every-savvy-traveler-knows/. Like trying to calculate how to fall in love or working out the stock market value of honey, too much beancounting when you travel surely goes against the spirit of the whole enterprise. Travelling for pleasure is all about freeing yourself from workaday concerns, so let’s just accept that one goal of saving money on the road should be to stash some cash for the next trip. When to book is partly destination dependent but crunching the numbers from various studies – including one by a group of Japanese economists – and the prognostications of assorted cheap-flight geeks suggests that, to save money, the optimum time to book long-haul flights is six months before you travel and, for short haul, no more than three months earlier. If that degree of planning already has you casting around for distraction, try setting a reminder on your device – perhaps with a link to this article – for when to start searching; you could set it to repeat if you go away around the same time each year. Yes, yes, we know: the skinflint instinct suggests that spending hours peering into a light-emitting screen trying to match cheap flight with cheap hotel availability surely has to pay off in a better price than if you went the slacker route and booked them together. Ah, that’s so, like, yesterday, dude! Sometimes the slacker instinct wins out instead. Especially in popular destinations, competition between hotels is so tough that they’re desperate to lure you in with cheap combined rates. Figures suggest the average traveller can save up to 15% by booking flight and hotel together. Save even more by hiring a car at the same time. Yet another bonus from booking all your holiday bits together? You’ll be Atol-protected so if anyone goes bust (ouch – it happens) you won’t. Here’s an edge-case holiday saving idea you might not (especially if you have a strong fashion sense) have considered – wear your luggage! Clearly a genius idea ahead of its time, the Rufus Roo travel garment, like a safari suit gone mad, had enormous pockets to stash all your holiday gear and save you having to pay for hold luggage. It appears not to be available any more but hunter’s survival vests available at outdoors stores or online have big back ‘poacher’s pockets’, serving much the same purpose. Romantic as those guys with moustaches reeling in the punters outside tourist trap restaurants might try to convince you it is, eating dinner out on holiday – especially if you make it a habit – can be ruinous. The secret is to plump (and we choose the word advisedly) for the menu del dia, menu du jour, etc at midday – in plain English, the midday, bargain two or three course meal that you’ll see local lunching office workers and the like opting for. The choice will be more limited than if you went large à la carte but proprietors know how to please their regulars with a selection likely to get tummies rumbling. Yes, plastic’s fantastically easy but that’s precisely how banks and other providers extract their pound of flesh from you, sliver by sliver. Use a standard credit card overseas and you could be coughing up 3% or more for each purchase in dodgy charges. Was there ever more pricey gunk than suntan lotion? C’mon, they invented the skin-protecting principle a few years ago now – they can’t still be fleecing us for R&D. Overseas merchants exploiting limited supply and our paranoia about turning into holiday savaloys actually explains most of the ripoff these days. Turns out pound store lotion can be just as reliable as the dear stuff. Skin care experts say a high sun protection factor (the ‘SPF’ number on the bottle) is more important than retailer or price. App-recommendation isn’t quite the new trainspotting but it’s definitely wearing an anorak. Who needs – you tend to think – more icons cluttering up your phone that don’t deserve the attention they’re trying to grab. 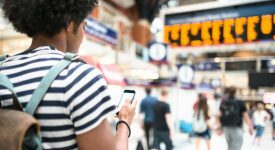 And yet a carefully curated selection of travel apps can certainly save you money on each trip. Some apps automate the tedium of budgeting; others show you where to snaffle free wi-fi; still others save you, out of embarrassment, tipping way too much in a strange land. There is justice in this world – roaming charges have shrunk to UK-sized in most of Europe. But they can still be brutally costly when you travel beyond the continent, especially if you’re using mapping apps to find your way around. The trick is to download the maps you need beforehand on apps such as Google Maps or (often more detailed because of all the user feedback) Maps.Me. The apps then use GPS to let you navigate – for free – to your heart’s content. Now, whoever said you had to fly in and out of the same airport? Airlines make money out of our assumption that you must tramp through the same big glass and metal box in both holiday directions. Truth is you’ll often save money by money by being flexible and mixing up departure and arrival leg airports. The world won’t tilt at an angle if you do. Now this might sound like the exact opposite of a money-saving travel hack but dialling it down for an hour or two in an airport lounge before you squeeze on the flight tube is, at the very least, a sanity-saving travel hack. And, no, airport lounges aren’t the exclusive preserve of Prada-sporting members of the global elite. In fact, you can often get free or cheap entry with certain credit cards or through ebookers BONUS+. Even if you pay £20 or so for one-off admission, you can win that back in free drinks and snacks. And just put your finger on your pulse and feel your blood pressure slowing if you really don’t think it’s worth the wedge.